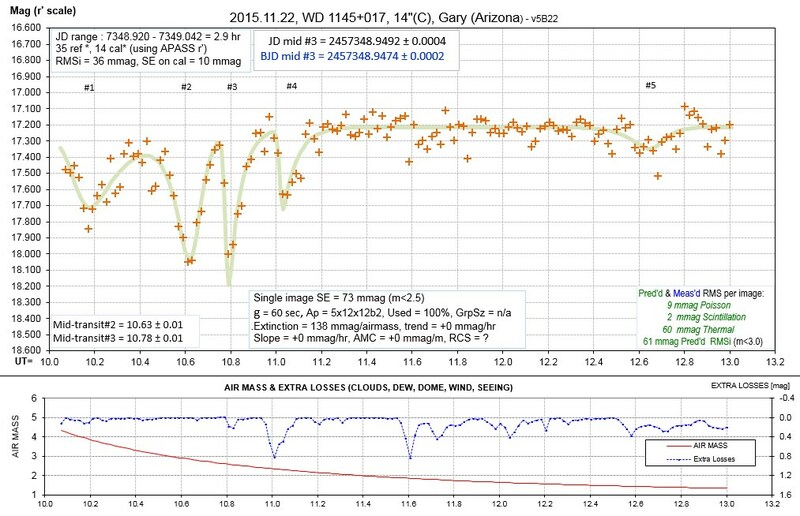 This is the first of three web pages describing amateur observations of a special white dwarf star. 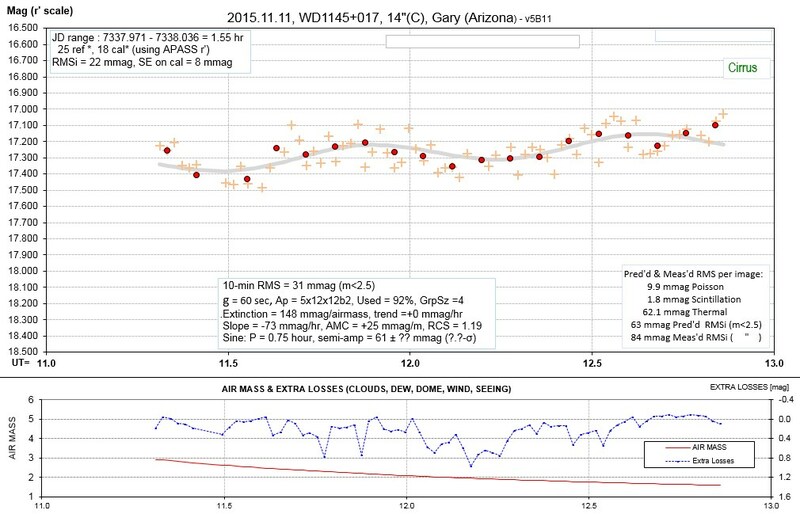 This web page describes observations from 2015 Nov 08 to 2016 Jan 21 (all by amateur observers). 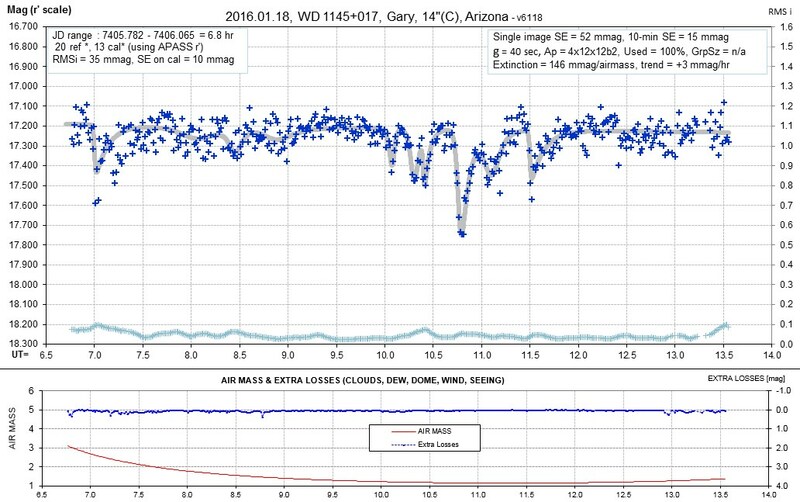 Observations from 2016 Jan 17 to 2016 Jul 13 (mostly by amateur observers) is described at http://www.brucegary.net/zombie2/. A fuller description of WD1145, and its significance, is found at the above web page. 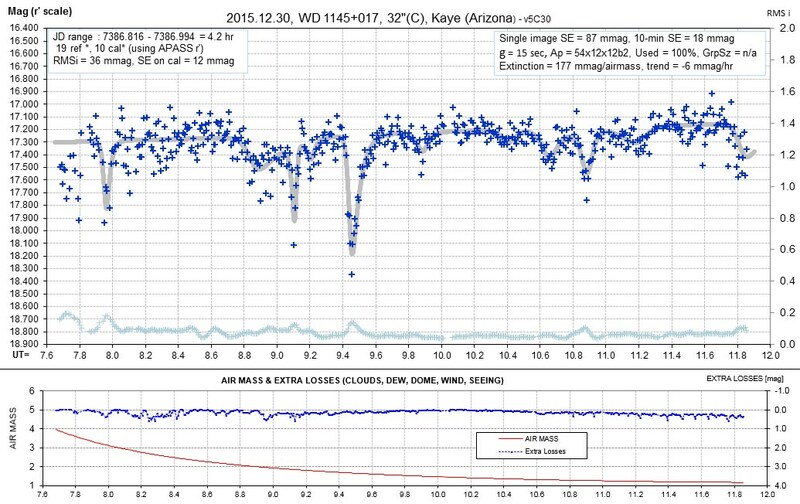 This web page is devoted to the first 2.5-months of photometric monitoring of white dwarf WD 1145+017 (a.k.a "a zombie star" in the popular press) by a small group of amateur astronomers for the purpose of characterizing transit features produced by dust clouds somehow related to asteroids in a close orbit around the white dwarf. 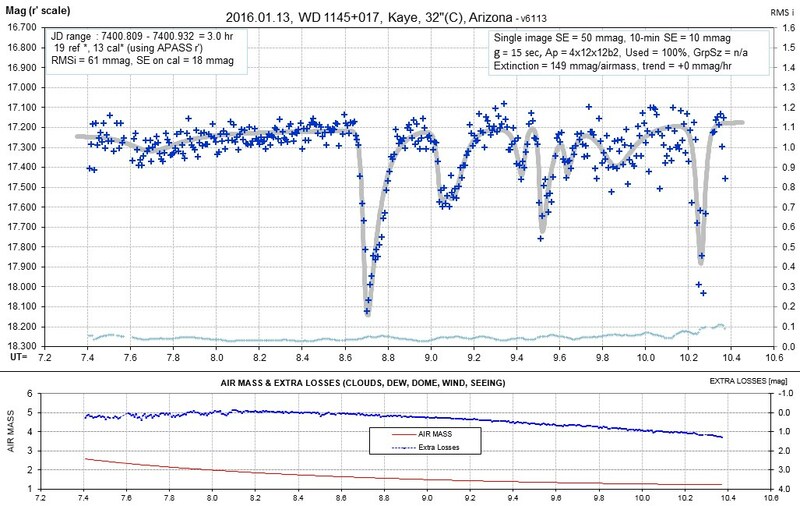 The discovery paper by Vanderburg et al (2105) describes how Kepler K2 data (2014 Jul to Sep) led to the recognition that this star underwent periodic fadings at intervals of ~ 4.5 hours. 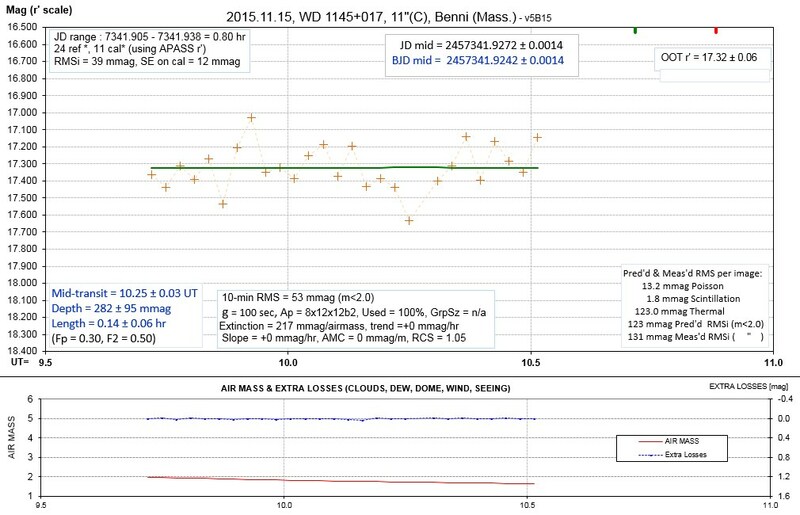 Ground-based follow-up observations were conducted by the Vanderburg team during 2015 Mar/Apr, and also by Croll et al (2015) during 2015 May. 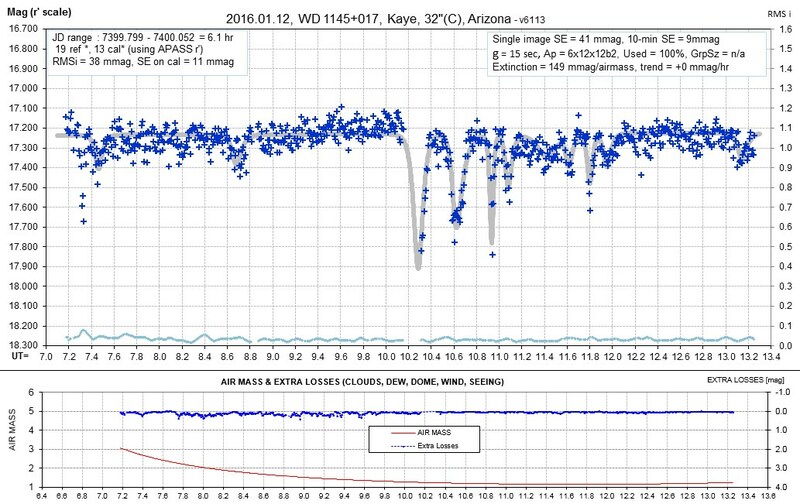 The goal for the observations presented here was to characterize fade activity (presence/absence, depths, periods) and establish an updated transit ephemeris and assess depth trends prior to the intensive observations by professional astronomers in February and March, 2016. This web page describes observations during the period 2015 Nov 08 to 2016 Jan 21, which are the basis for a publication in MNRAS by Rappaport et al, 2016. I continued to observe after this publication cut-off date, and those observations, along with observations by others who joined me in April (covering the 6 months 2016 Jan 17 to Jul 13) are described on another web page: http://www.brucegary.net/zombie/. A publication describing the entire 8 months of observations (2015 Nov 08 to 2016 Jul 13) has been submitted to MNRAS; an arXiv version of it will become available on 2016 Aug 01. 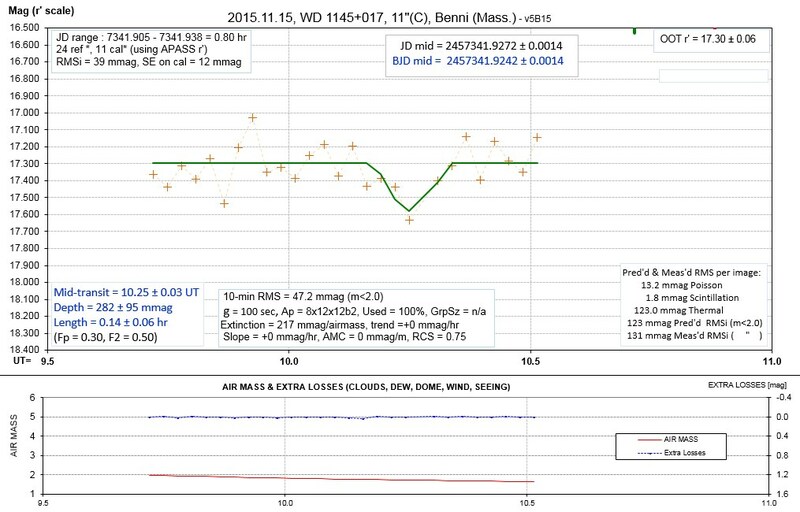 WD 1145+017 (hereafter WD1145) has a mostly helium atmosphere (with some hydrogen) that show many metal lines. The metal lines indicate the presence of a continuous flow of dust onto the WD surface (and rapidly sinking). IR fluxes out to 4.6 micron wavelength reveal the presence of an "IR excess debris disk" with an effective brightness temperature of ~ 1145 K and solid angle of ~116 times that of the WD disk (Vandergurg et al, 2015). 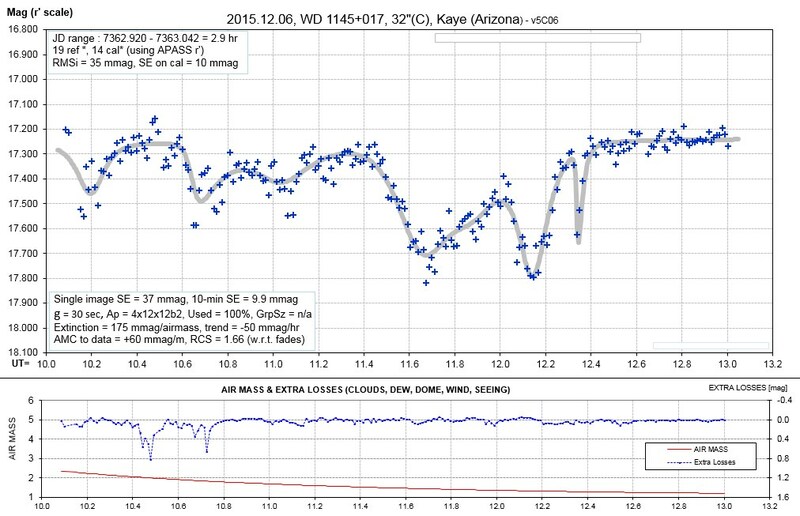 Kepler K2 observations show fade features that repeat at 4.500 hour intervals (the A period), 4.605 hours (B period), and smaller amplitude fades with period as long as ~4.9 hours. The K2 fade shapes and peak depths could not be characterized well because the Kepler exposure times were 30 minutes. 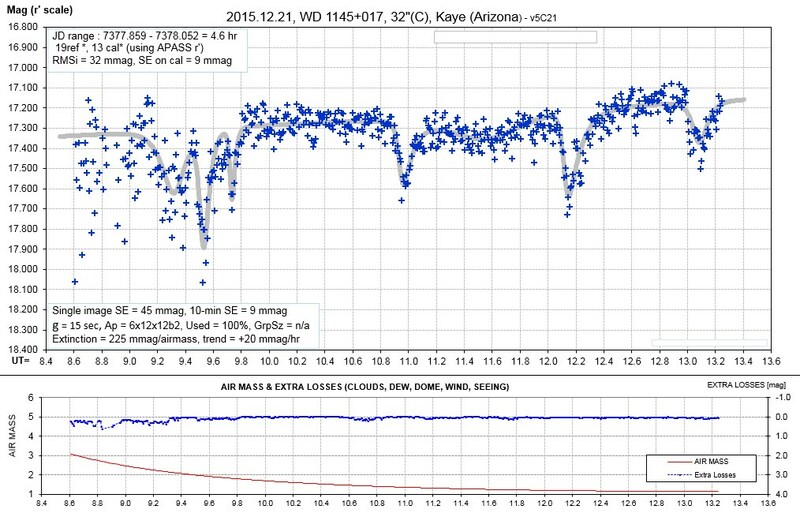 K2 depths varied from <0.4 % to ~2.0% (based on 30-minute exposure time data). It is speculated that at least one asteroid is disintegrating and producing fragments that are the source of the dust clouds (Rappaport et al, 2016). Early results of the present observations show that some of the fades are deeper than previously observed (i.e., fades of 60% of the un-faded flux). 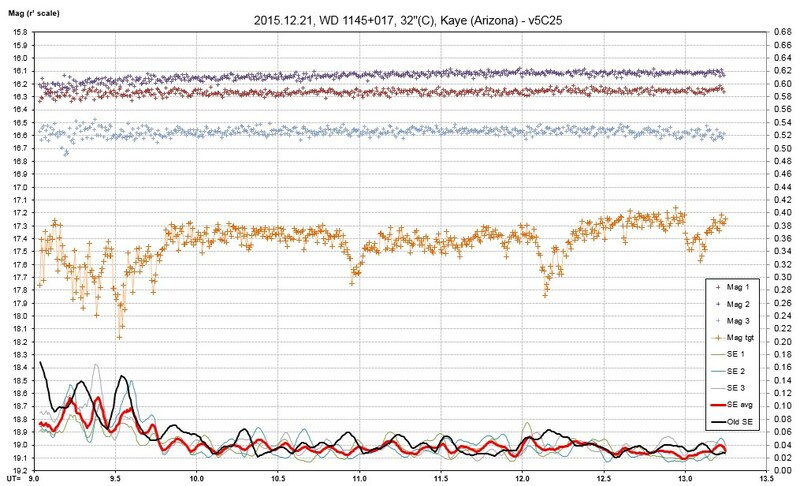 When our light curves (LCs) are smoothed to simulate the Kepler K2 observations (i.e., 30-minute averages) the fade depths are dramatically greater than the K2 observations (1.5 years earlier) and also the professional ground-based follow-up observations (o.5 years earlier). The ratio of overall depth activity is as much as 25 times greater! Another curiosity is that essentially all of the individual fade events exhibit phase drifting to earlier times in successive dates. An individual fade event can in this way be tracked for many weeks, and possibly months. All of these new behaviors are real, not observational artifacts, because whenever 2 or 3 telescopes produce overlapping LCs the fade features are seen in all of the LCs. The earliest observing sessions (starting Nov 08) were much shorter than a 4.5-hour orbital period, due to the late morning rise time. 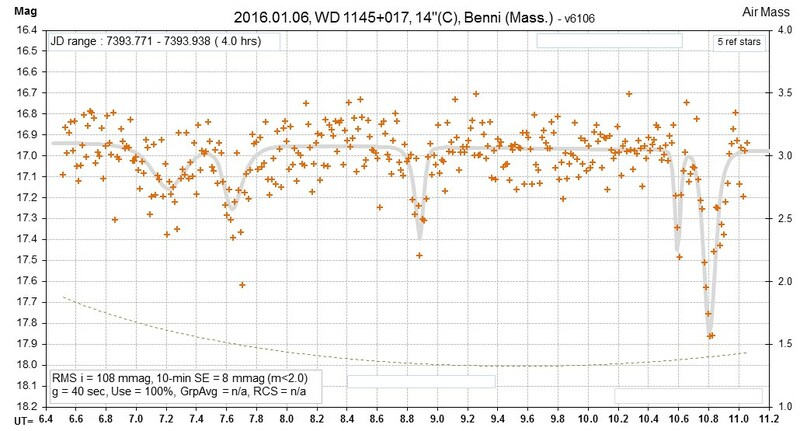 By the end of the first 2.5 months, in late January, 2016, observing sessions were ~ 6.5 hours long. The "observing season" for WD1145 is centered on Mar 17, when 9.5-hour observing sessions are possible (for observing sites at 31 deg latitude). WD1145 is located at RA/DE = 11:48:33.6 +01:28:59 (J2000). V-mag ~ 17.0, B-V = -0.6, r'-mag = 17.4. This ephemeris produces a shift in the fade patterns (assuming long lifetimes of dust clouds) of -1.498 hours/night (i.e., earlier). UT' = 24 × (JD - 2457347.5) - E × P, where E = integer of (JD - 2457347.95) / (4.4996 / 24). E is adjusted to keep UT' < 15. Example of a "waterfall" graph, showing presence of fade features vs. observing date using a period for the outer orbit asteroid. Width of blue symbols represent depth (1.00 - NormalizedFlux). The length of the symbols are from 35% of max depth for ingress to 35% of max depth for egress. 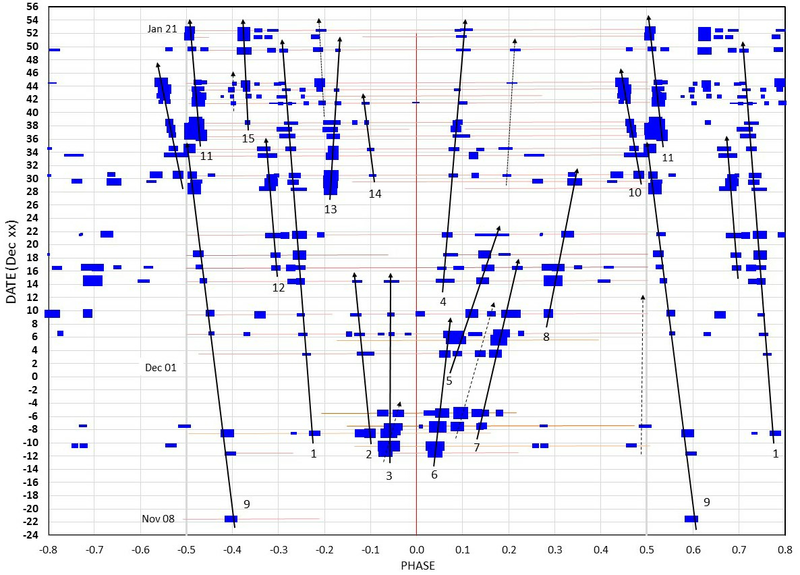 This drift plot uses a period for representing a typical inner orbit fragments period. The above graph will eventually cover a 2 month interval (Nov 21 to Dec 30). Since at least 6 of these fade patterns are present, and since the particle size distribution (PSD) consists of mostly small particles that shouldn't last for more than a day or two, we must hypothesize that the fade events are produced from separate asteroids that are almost continually emitting dust on timescales of at least 13 days. I suggest that there are ~ 12 asteroids in the same orbit, with P = 4.4908 hrs, and that they are producing dust emissions (escaping the asteroid) almost continuously. Since the production rate can vary the fade depth and width will vary vs. date. 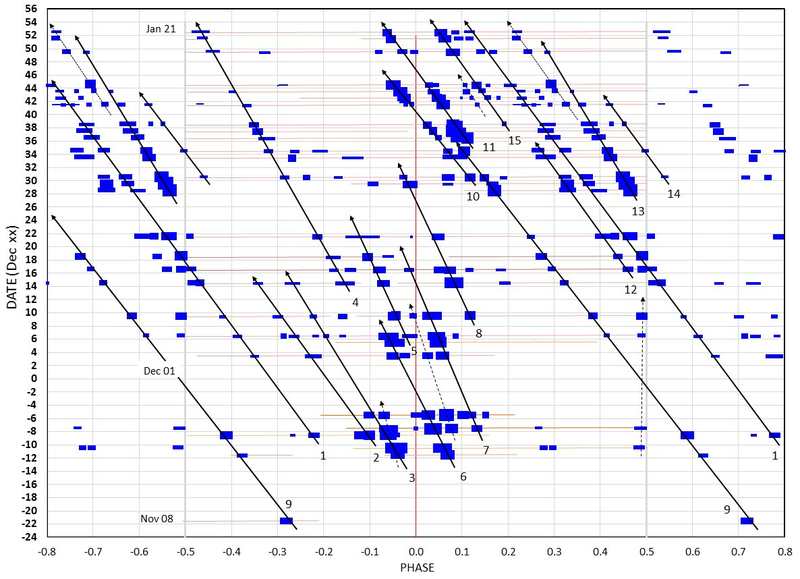 Future plots will show how the fade associated with each named asteroid varies in depth and width (ie., equivalent width) vs date. 50 observing sessions, totaling 186 hours. On this date Kaye & Gary obtained data. Only Benni observed on this date. On this date Kaye & Foote obtained data. Combining Kaye & Foote data. 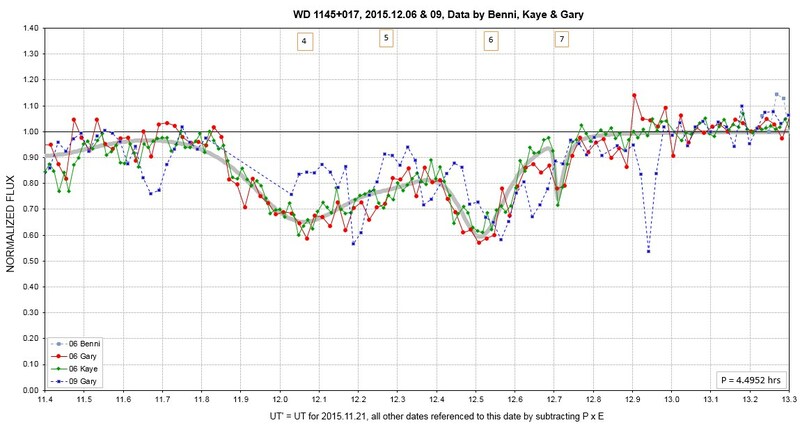 On this date Gary, Kaye, Foote & Benni obtained data. Middle section of previous phase-fold LC, showing agreement of 4 observers. On this date only Kaye obtained data. 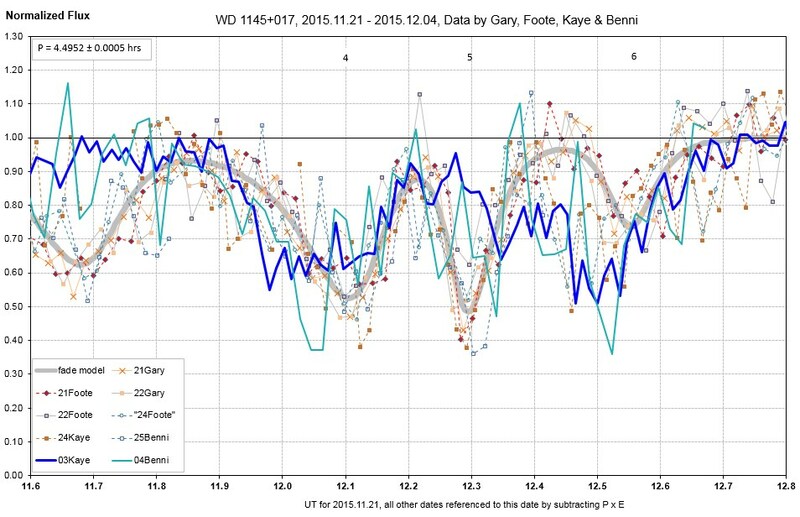 On this date Kaye and Gary obtained data. On this date only Paul Benni obtained data. On this date only Paul Benni obtained data (using his new 14" Celestron). On this date only Tom Kaye obtained data (using JBO). An alternate interpretation, phased with the A-period. 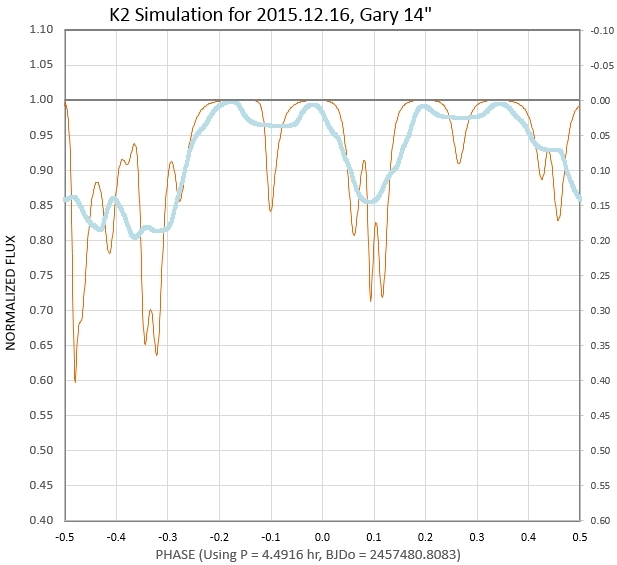 This LC combines the Kaye & Gary observations that together cover 4.7 hours (> 1 orbit). Tom Kaye obtained this LC under partly cloudy skies that eventually became too thick for observing. I obtained a short orbit's worth of data. 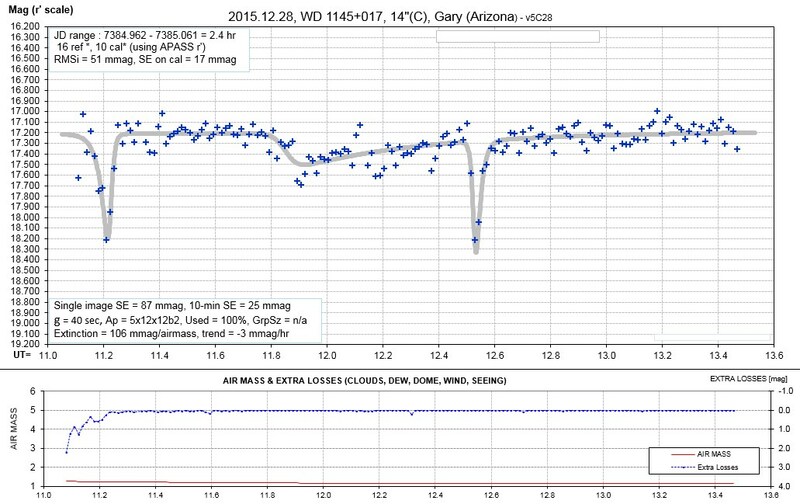 Tom Kaye and I obtained a full orbit's worth of data. Phase-folded version of the same data. I want to comment on a few events. Today's #4 might be the Dec 16 #2 (11.35 UT'). Most fade events were moving left at ~ 4 min/day, so in 5 days the movement should be 0.33 hr. The Dec 16 #2 event should now be at 11.00; it's at 11.05, which is close. Today's #7 might be the Dec 16 #5, phase shifted to an earlier time by only 5 minutes. Today's #9 & #10 might be associated with Dec 16 #8 (12.32 UT'). The shift between them is ~10 minutes. I suppose one could argue that today's #1 & #2 are a drifted version of Dec 16's #9 & #10 (14.06 & 14.21 UT'). The noise in this LC didn't justify fitting structure in the 9.2 - 9.8 UT region (that is evident in the more precise JBO/Kaye LC). The same applies to the 13.0 - 13.2 UT region. Example of deriving SE for WD1145 magnitudes by using 3 nearby stars, showing that they are better than SE derived from neighbor differences of WD1145 (due to WD1145 mag vs UT exhibiting abrupt changes that are real). Three nearby reference stars are used, and their SEi values are adjusted for the mag difference bewteen each of them and WD1145. Only Paul Benni observed on this date (during cold, through holes in the clouds). The LC by itself isn't impressive, but the true value of this data becomes apparent when it is compared with LCs from 2 & 4 days earlier. Phase-folded LC for 3 dates, with separations of 2 days. The fade model is for Dec 16. Notice the newly adopted P = 4.4996 hrs. I want to comment on each of the fades, starting from the left end. Fades 1 & 2 are shallow, and Paul's noise was too great to detect them. Fade 3 is a "sharp" one, and it has moved leftward at the same rate suggested by the Dec 16/18 comparison. Depth and width are similar. Clouds prevented measurement of fade 4. Fade 5 seems to be present still, without a phase shift. Fades 6 & 7 are too shallow for measurement. Fade 8 resembles fade 3 by being sharp; although clouds interfered with getting the onset of this fade, it does appear to be present in Paul's data, and possibly shifted leftward by a small amount. Fade 9 is growing in width and depth, and appears to be moving leftward slowly. The fade 10/11 pair are still present, and maybe growing deeper and continuing their leftward phase shift. 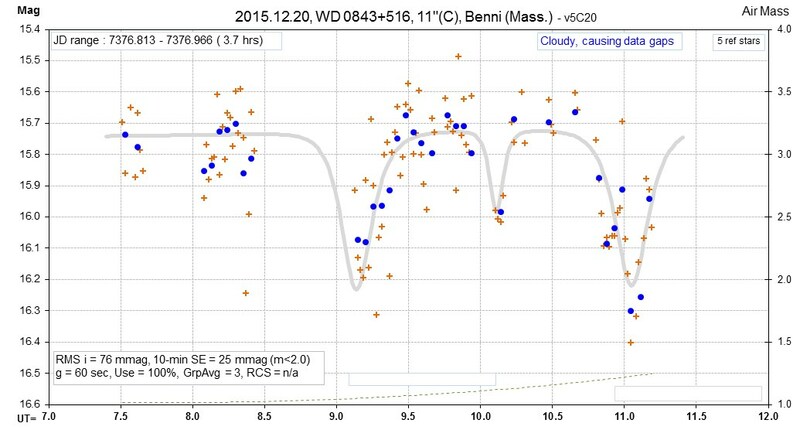 Paul Benni observed in the cold through holes in the clouds, and produced a LC that was unusually valuable in confirming fade phase drift behavior. The LC by itself isn't impressive, but the true value of this data becomes apparent when it is compared with LCs from 2 & 4 days earlier (see above). 60-second exposures with a 11" telescope. The fade fit was made before consulting the fade model fit for earlier dates, and it therefore misses a true fade at 8.3 UT and the fact that the fade at 11.0 UT is actually a double fade. Phase-fold LC, using P = 4.4996 hrs. 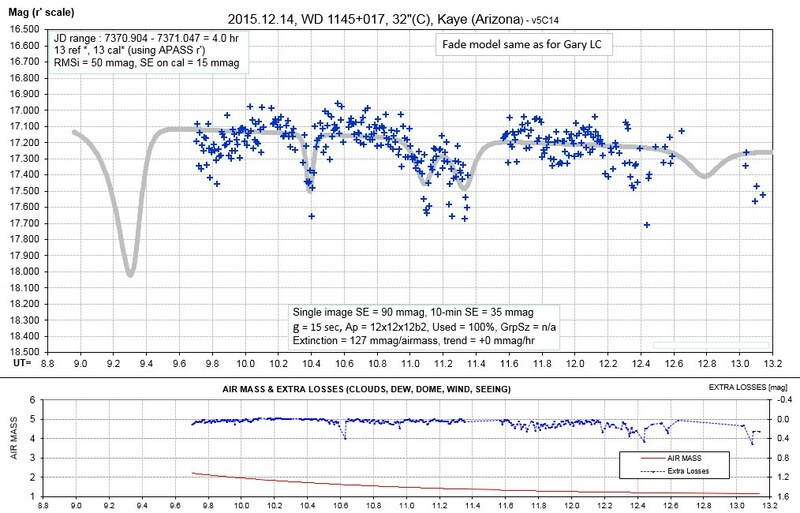 The Gary Dec 18 LC (40-second exposures) is compared with the Gary/Kaye consensus LC for Dec 16 with the fade model fit for Dec 16. The fade event numbers at the top are for Dec 16 data. All times are UT', not UT. Two sharp fades are present in the Dec 18 LC, at 11.6 & 13.3 UT'. Both have trailing tails and each goes from the no-fade level to peak fade in 1 minute or less. Each occurs ~ 6 minutes before counterpart sharp fades 2 days earlier (fades #3 & #8). Thus, these two sharp fades appear to be shifting to earlier times (i.e., smaller orbits). 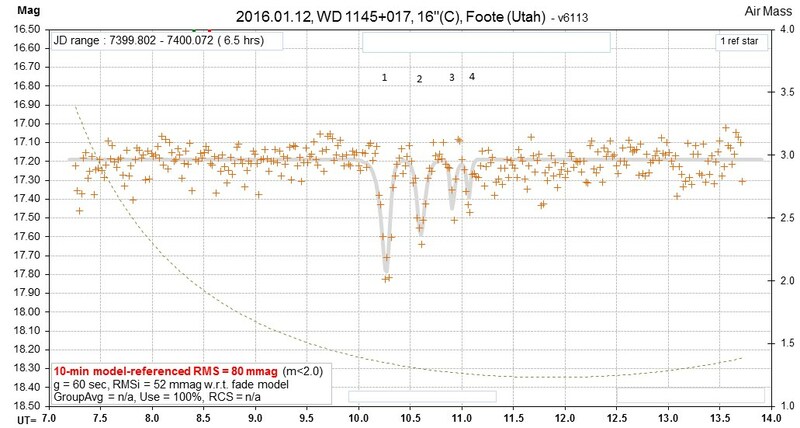 At 14.05 UT' the Dec 18 broad fade might be associated with fade #9 of 2 days earlier. 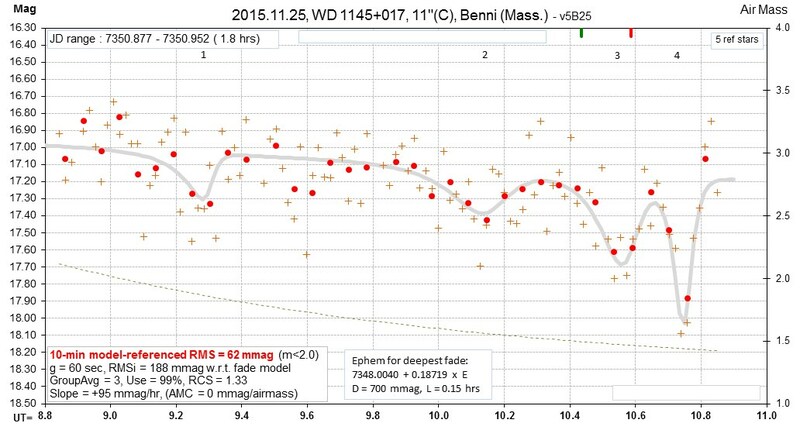 A moderately sharp fade is present at 14.3 UT' that might be associated with fade #10 & #11. It is tempting to wonder if fade #11 shifted to the location of #10, causing it to appear deeper. Another version using a slightly different period. There must have been a dome synchronization problem. Kaye and Gary observed on this date. First, I show the combination of both LCs. Both observer LCs agree on all fade features. JBO exposure time = 15 swc. HAO exposure time = 60 sec. On this date WD1145 is still "active," exhibiting 5 fade features during a 4.0 interval (~90% of a complete orbit). The following LC is a combination of overlapping LC data, and since both show the same fade features (where overlap exists) all features are probably real. One fade model fits both data sets. This normalized plux phase-fold LC uses my adopted standard time units, UT'. Previously, the main activity has been within the 11.6 to 12.7 region. The previous LC, on Dec 09, had a sharp (5 min) fade at 12.7 UT'. In this LC we see a sharp fade at 14.0 UT', which used to be an inactive region. 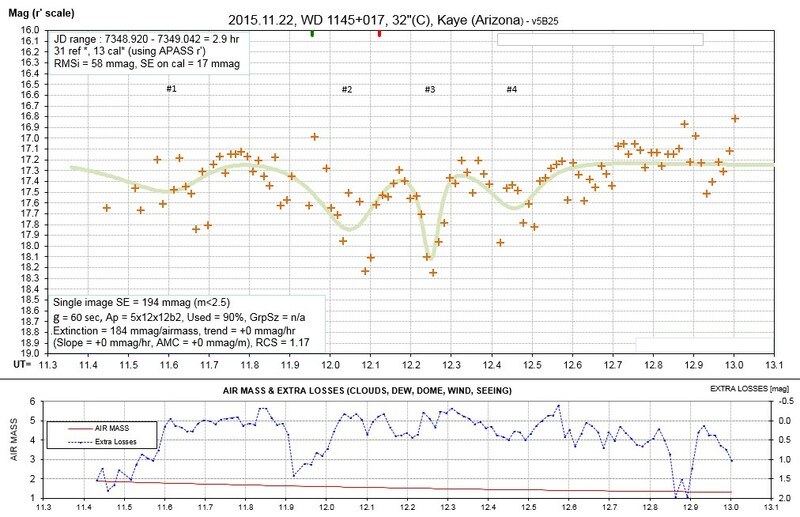 2015 Dec 14: JBO/Kaye, 32"
This 4.0-hr observing session was made during horrible "atmospheric seeing" conditions (winds aloft). This is the same fade model fit used for the Gary overlapping LC. 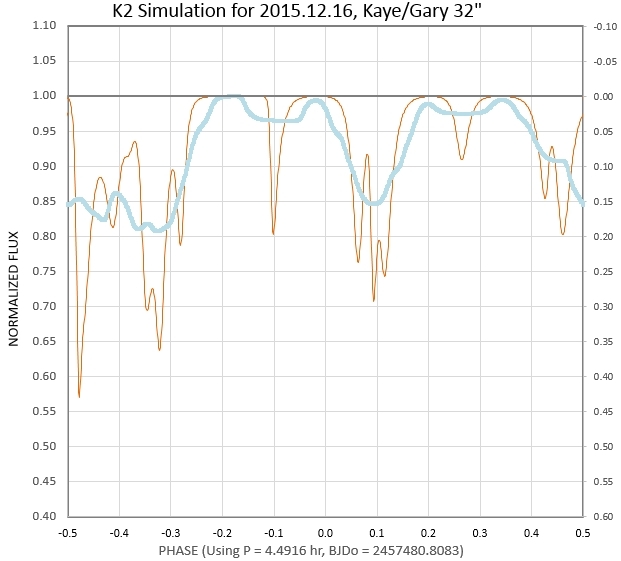 2015 Dec 14: Gary, 14"
The fade model fits this data, and also the JBO/Kaye LC data. In fact, the model is a fit to BOTH sets of data. Only Gary observed on this date. This 2.9-hr observing session was made with a "crescent moon" ~ 26 deg away, rising after WD1145. If another LC overlapped this one, and showed the same sharp, new fade at UT' = 12.5, I'd believe it. We really need pairs of LCs to know what's real. Things changed during the 3 days since Dec 06. This is a zoom of part of the previous LC. Observations were made by Benni, Kaye and Gary. 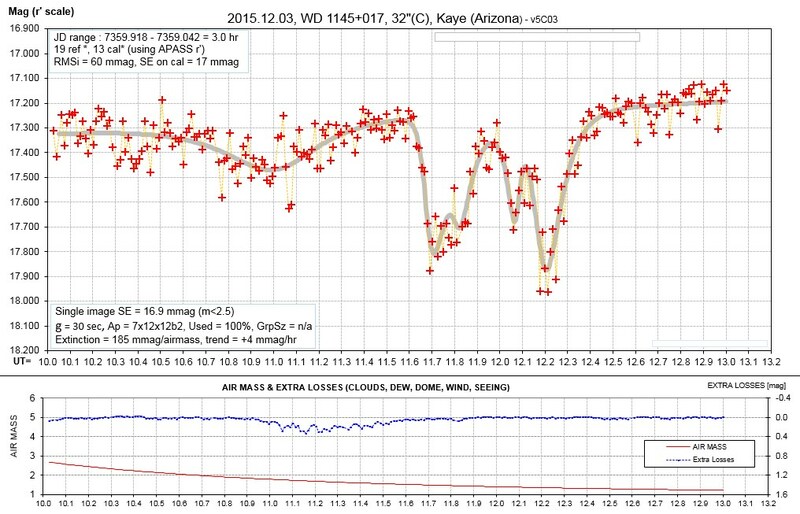 2015 Dec 06: Kaye, 32"
This 2.9-hr observing session was made with a "crescent moon" ~ 26 deg away, rising after WD1145. This is the most precise LC so far by this team of amateurs. 7 fade events are modeled. 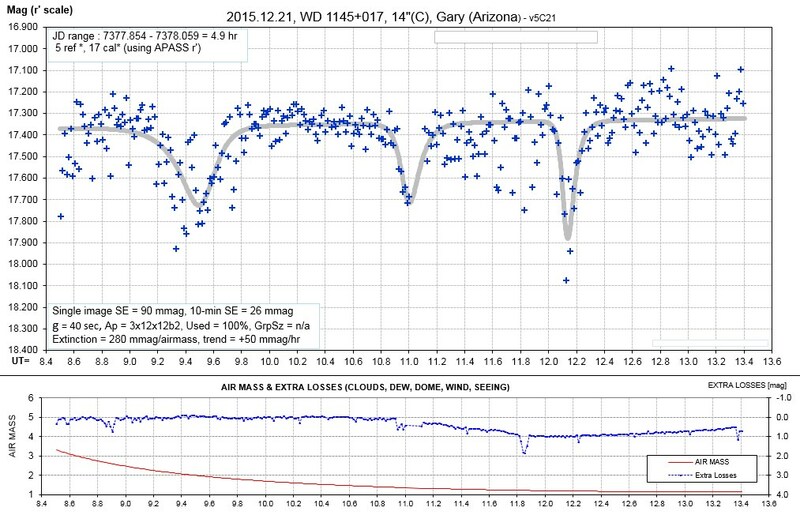 2015 Dec 06: Gary, 14"
This 4.3-hr observing session was made with a "crescent moon" ~ 26 deg away, rising after WD1145. There's a 1-image fade at 10.13 UT, with dMag = 0.25 ± 0.05), in agreement with Benni's LC. 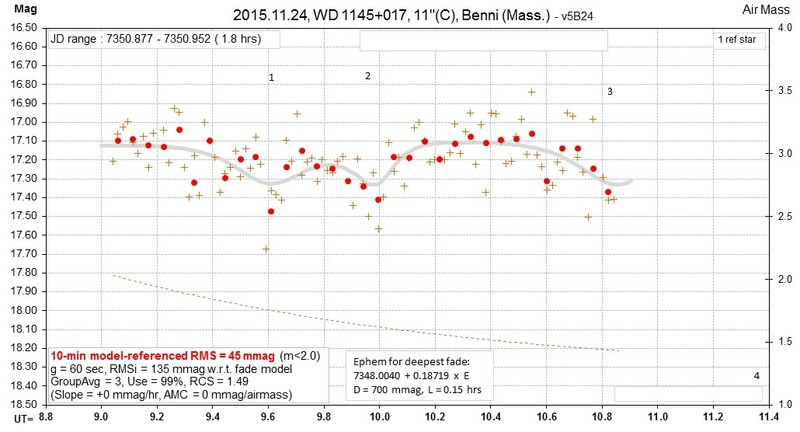 2015 Dec 06: Benni, 11"
This 2.6-hr observing session was made with a "crescent moon" ~ 24 deg away, rising after WD1145. The two single-image fades are interesting. Do they occur in simultaneous data by other observers? 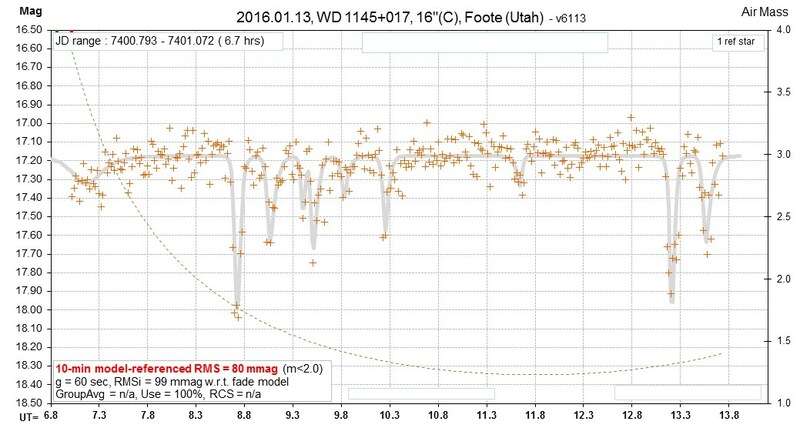 Note the fade at 10.13 UT (dMag = 0.5 ± 0.1). 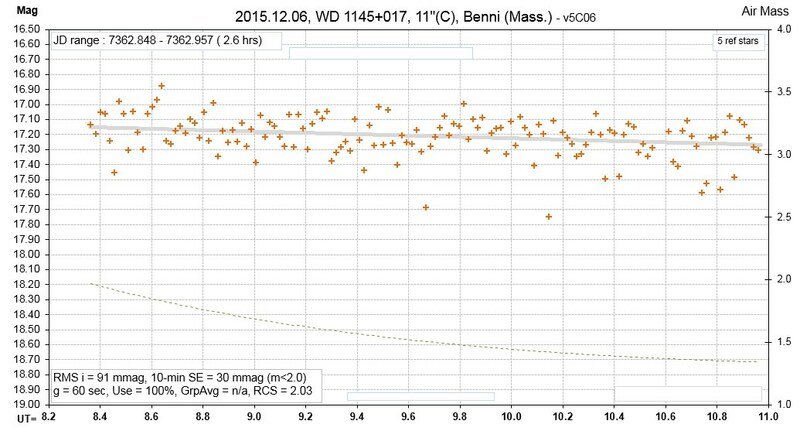 2015 Dec 05: Benni, 11"
This 2.5-hr observing session was made with a "crescent moon" was ~ 10 deg away, rising after WD1145. 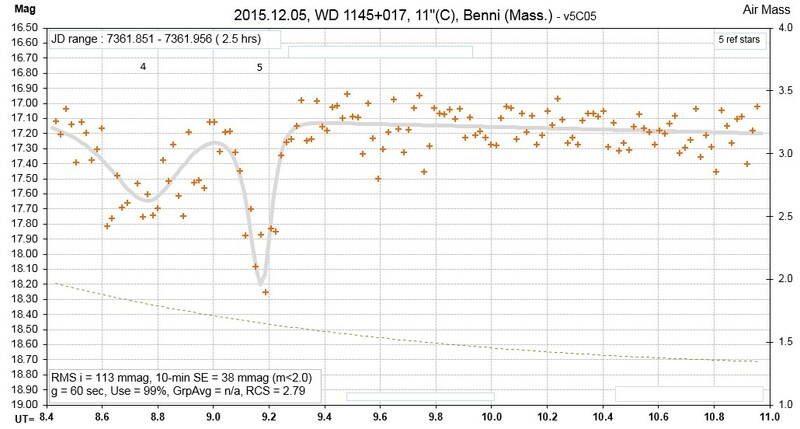 2015 Dec 04: Benni, 11"
This 2.1-hr observing session was made with a "crescent moon" just ~ 2 deg away. 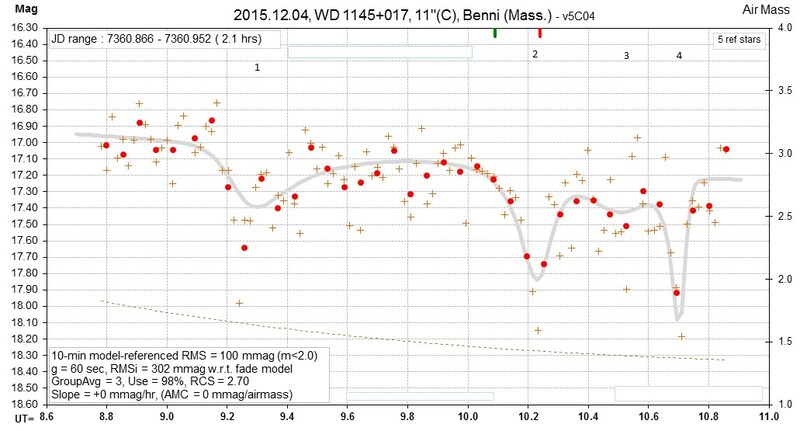 Here's how Benni's Dec 04 LC compares with all previous ones for the main activity region. Fade#4 appears to be "stable" (present all the time, Nov 21 to Dec 04, and having similar depth). The other fades vary. 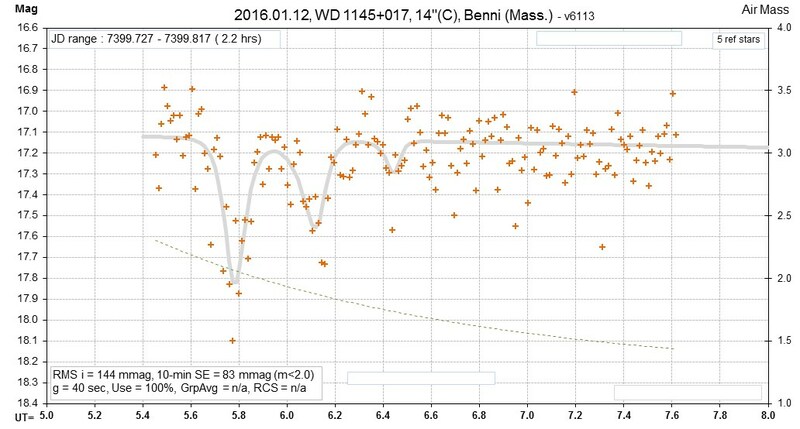 Here's how Benni's Dec 04 LC compares with all previous ones for the entire orbit period. 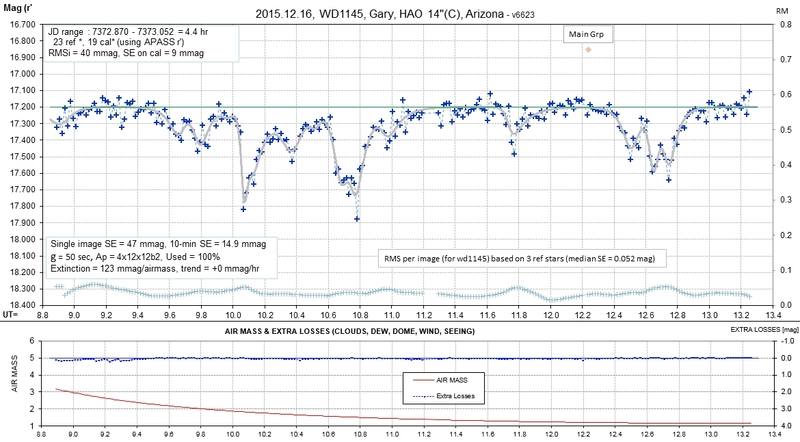 2015 Dec 03: Kaye, 32"
This 3.0-hr observing session was made with a "half moon" just 13 deg away. 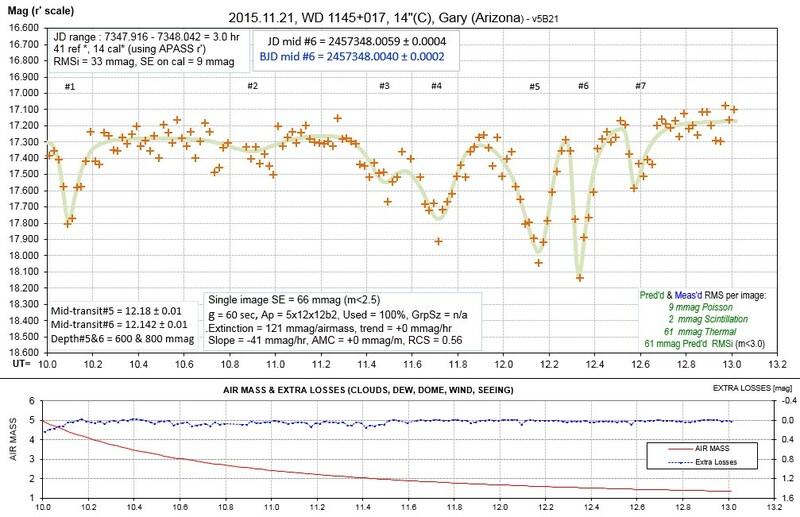 2015 Dec 02: Kaye, 32"
This 2.9-hr observing session was made with a gibbous moon 26 deg away. Seeing was poor at the beginning. There's "no correlation" between this Dec 02 LC and the Nov 21-25 LCs. Things change! 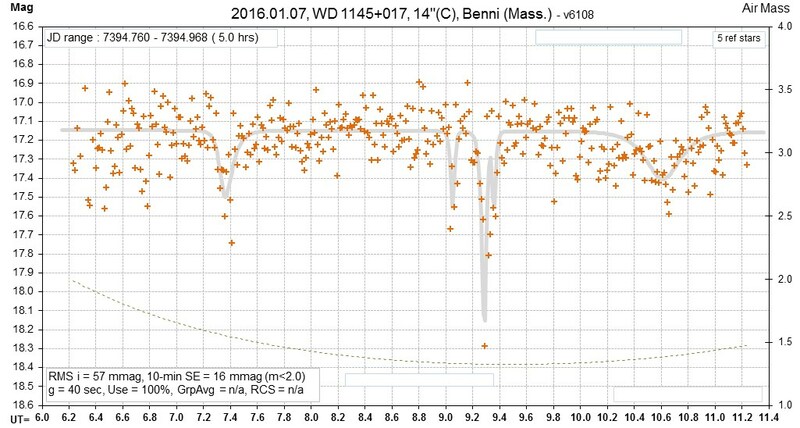 2015 Nov 25: Benni, 11"
This 1.8-hr observing session was made with the full moon setting in the west. The first fade may not be real, but the others are. This 2.9-hr observing session was made with the full moon setting in the west. Cirrus was in the line-of-sight, reflecting moonlight and absorbing signal. The Kaye and Foote data agree! This 1.9-hr observing session was started as the full moon was setting in the west. This 1.8-hr observing session was made with the full moon setting in the west.I don't know if I believe these 3 fade events. This phase folded LC is a combination of 4 LCs, two from Nov 21 (Gary and Foote) and 2 from Nov 22 (Gary & Foote). This observing session was 2.9 hours long. 7 "events" were detected. Most of them were confirmed by an overlapping LC by Jerry Foote (see above). Model is for both Gary & Foote data, using chi-square minimization. On this date Gary & Foote observed. This observing session was 3.0 hours long. 7 "events" were detected. Most of them were confirmed by an overlapping LC by Jerry Foote (see above). Each symbol is from a 60-second image. The model consists of exponential functions (e.g., Croll et al, 2015). 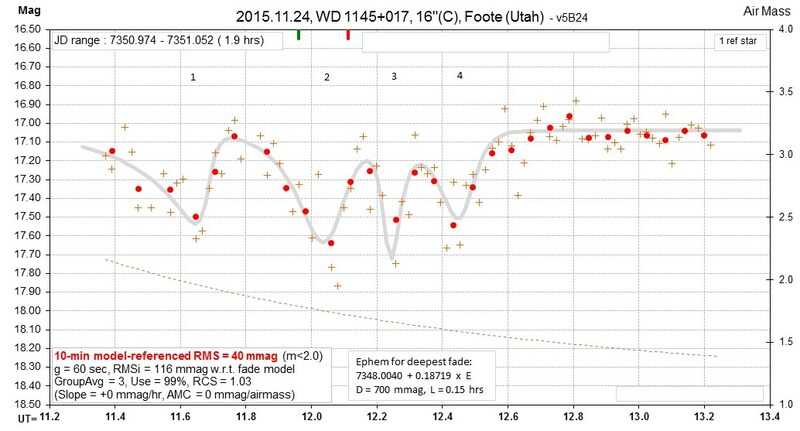 r'-mag vs UT for target (thick red trace) and 36 nearby stars. 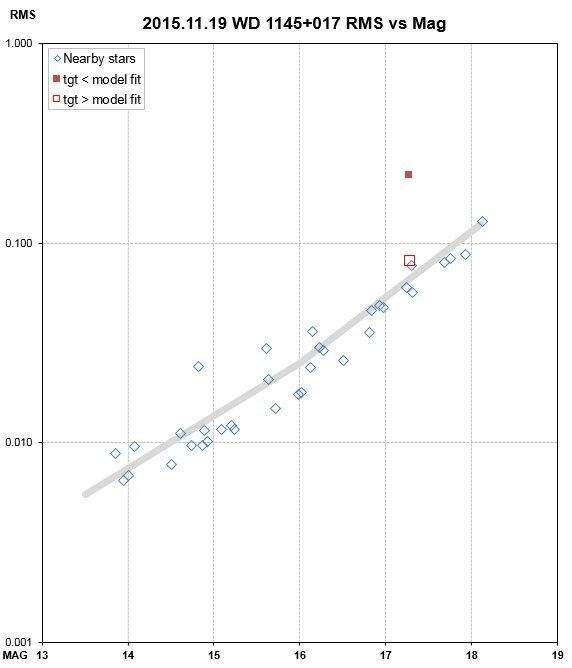 RMS vs r'-mag for target without a model fit (filled red square) and with a 7-fade model fit (open red square), plus 36 nearby stars (assumed to be constant). Only Gary observed on this date. 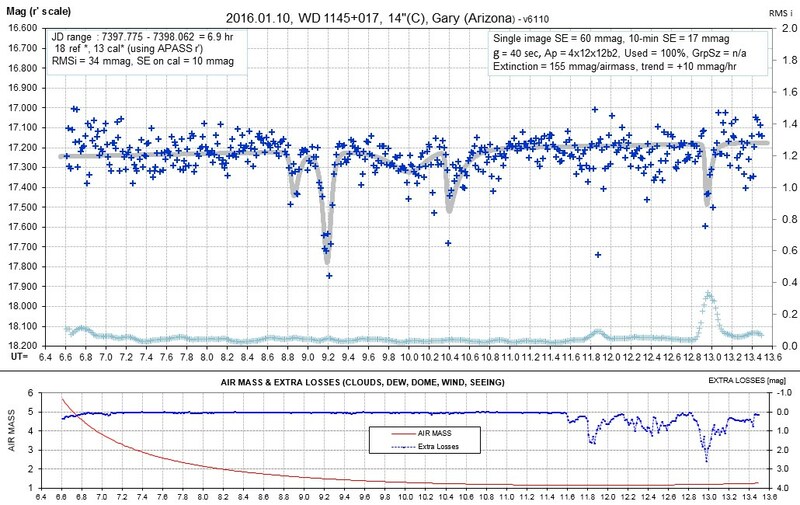 This observing session was 2.9 hours long, and the tracking problem of the previous night was demonstrated to have been fixed (by slightly unbalancing in declination). This LC is consistent with the previous night's LC by showing two transit features separated by ~ 1/2 hour (30 & 27 minutes). A period of 4.495 hours could account for the #2 transit features of this night and the previous one. The double-transit features appear to shift -1.53 hours per day. Features #3 and #4 are ~ 200 mmag deep, with lengths ~ 12 minutes. I suggest the following ephemeris: JD transit#2 = 2457345.9443 + E × 0.187292, JD transit #1 = 28 minutes earlier. The solid red square is for the WD on the assumption that it is not variable. The open square is for WD on the assumption that the LC model with 4 fade events (previous figure) is justified. The open blue diamonds are for 35 nearby (reference) stars. The fact that the open red square for WD "belongs" to the population of nearby (presumably non-variable) stars means that the LC model, with 4 fade events, is compatible with the statistics of all measured stars, and the 4-fade model is justified on statistical grounds. If the open red square had fallen below the population of nearby stars a case would have existed that the 4-fade model was unjustified; i.e., that it incorporated too many degrees of freedom for representing the WD measurements. Only Gary observed on this date. The red symbol is for the WD and the others are for nearby (reference) stars. 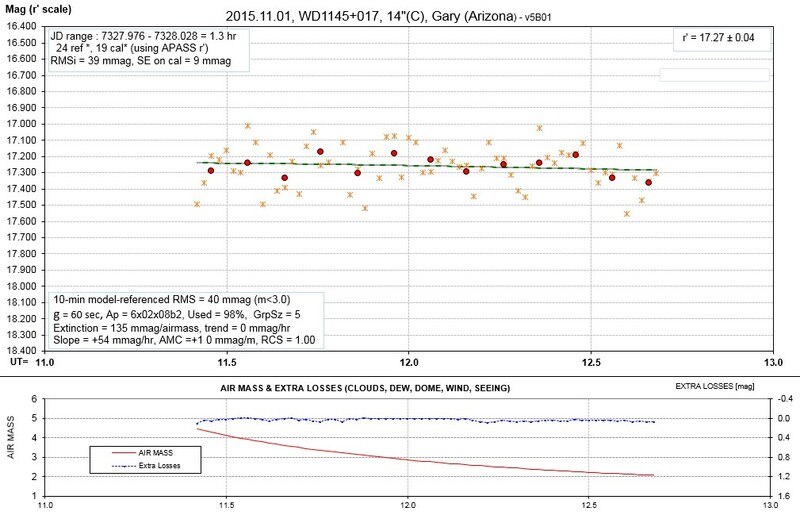 The fact that the WD exhibits a larger than expected RMS is consistent with the WD undergoing real variations. 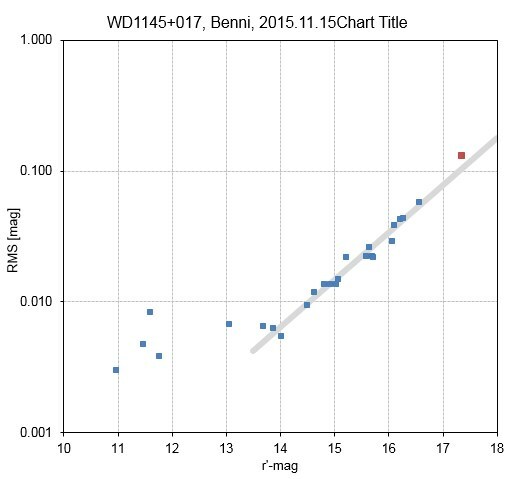 2015 Nov 15: Benni, 11"
This 0.8-hr observing session was intended to assess the presence of a transit that was predicted at 09.73 UT (if P = 4.6 hr) or 10.63 UT (if P = 4.5 hr), assuming that the transit-like feature observed on Nov 08, at 12.21 UT, was real. It is my opinion that no transit was observed on this date (Nov 15), but the noise level is such that it can't be ruled-out. LC without a transit feature. Reduced chi-square (RCS) is 1.05, which is close enough to one for arguing that the model fit is statistically acceptable. LC with a transit fit. RCS = 0.75, implying that the model has too many free parameters (i.e., the transit interpretation is unsupported). However, if this transit is real it could be accounted for with P = 4.490 hr or P = 4.615 hr, both of which are compatible with a previously published LS periodogram. 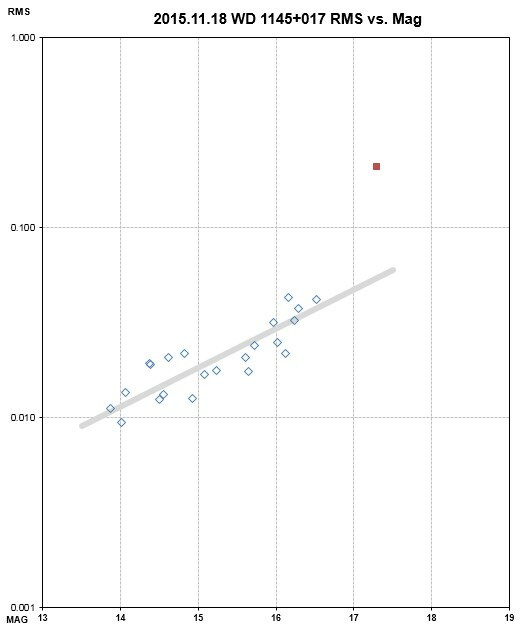 Plot of RMS off average for 24 reference stars and the target (red square). The target has an RMS that statistically "belongs" to the model fit (based on it departing from the model by an amount similar to the scatter of the reference stars). It is my opinion that a transit feature interpretation cannot be justified on the basis of noise level considerations. 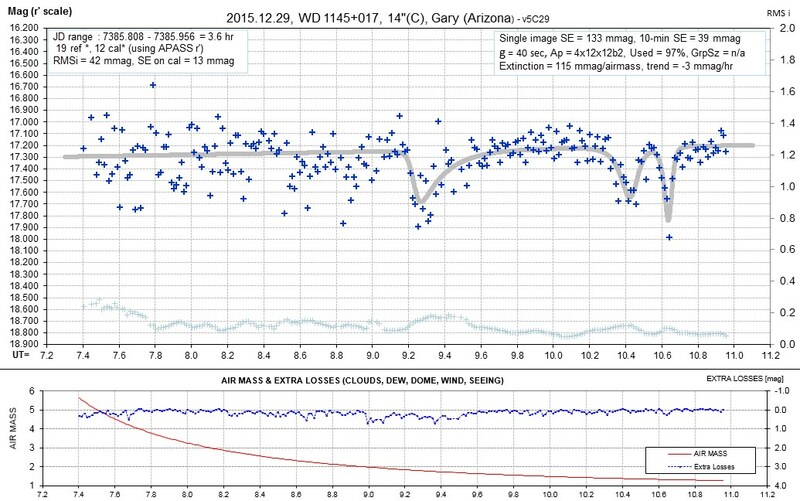 2015 Nov 11: Gary, 14"
This 1.5-hr observing session was intended to assess presence of transit that was predicted at 12.2 UT from the previous LC and using P = 4.5 hrs. No transit exists! Therefore, if the Nov 08 feature is a transit then P must not be 4.5 hrs. P = 4.6 hrs is still possible (predicting transit on Nov 13, 11.8 UT). 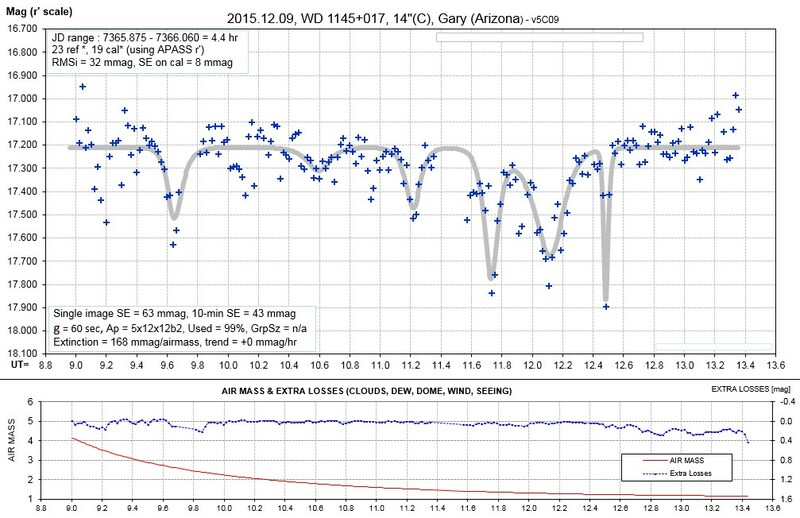 This 1.3-hr observing session demonstrates the feasibility of monitoring WD1145 with a 14" telescope. Light curve with fit using slope and air mass curvature. We Amateurs "Don't Get No Respect"
I'm going to try to be as honest and fair as possible in the following, while refraining from being critical. Indeed, I'm going to give the "benefit of doubt" to the professional astronomers associated with the WD1145+017 investigation. Astronomers, as in most scientific disciplines, can be divided into two major groups: observationalists and theoreticians. But there's another way to categorize this field: amateurs and professionals. Way back in the 1960's I was a professional radio astronomer, but after a decade I transitioned into the atmospheric sciences, where I was employed (by Caltech) for 34 years. After retirement in 1998 I resumed a childhood hobby of astronomy, as an amateur. Since retiring I've collaborated and co-authored with professional astronomers for the past 12 years, with ~ 37 publications. I'm therefore in a unique position to comment on the state of pro/am collaborations in this field. WD1145 was discovered using the Kepler spacecraft during its K2 mission. 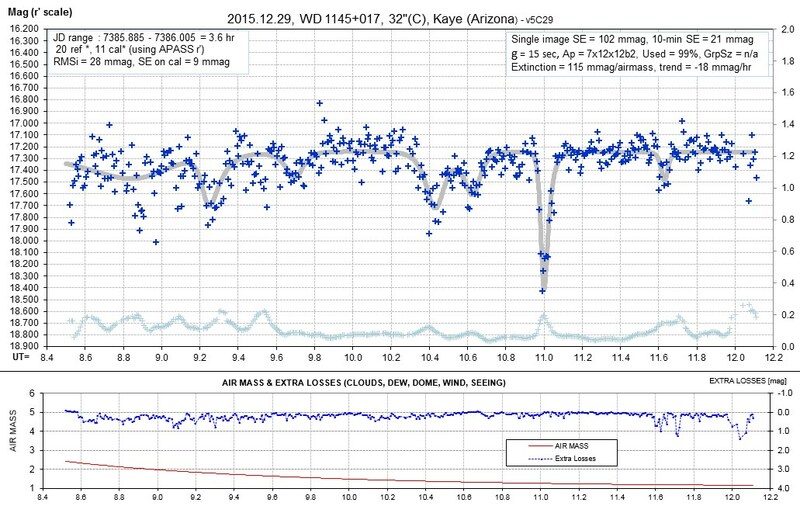 I presume that when it was recognized as an unusual star system, probably in early 2015 by Dr. Andrew Vanderburg and collaborators, it was clear that follow-up ground-based observations would be needed to improve understanding of the somewhat erratic dips in the K2 data. 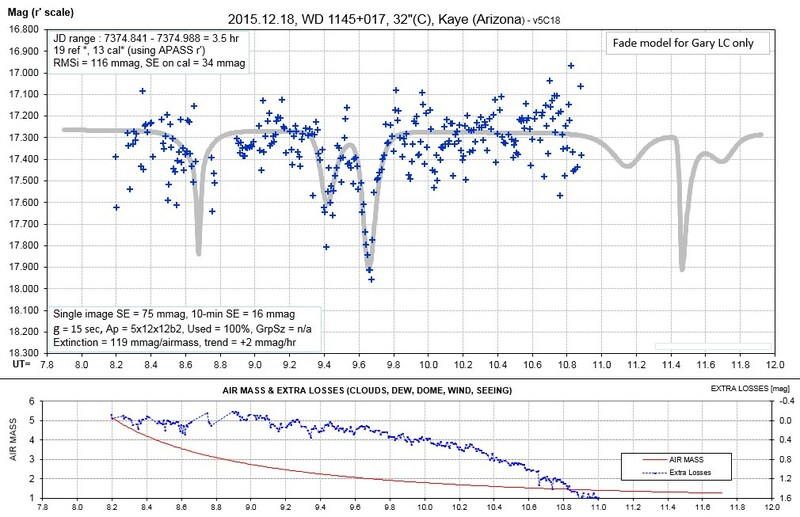 Fades of ~ 1% appeared to last about an hour in the K2 data, occurring at 4.5 intervals, and the amplitude would vary on weekly timescales within the range ~ 0% to 2% during the 80-day Kepler observations. WD1145 is a very blue 17th mag star, so I'm guessing that the professional astronomers who shared this information assumed that only professional observatories could provide follow-up ground-based observations. Some professional astronomers used to be amateurs, but probably most haven't been. Those practicing professional astronomers who have never been an amateur must have a low opinion of what amateurs are capable of. The truth, for those professionals who are still clueless about this, is that amateurs today are capable of professional quality work for specific categories of observing and analysis. I tried to describe this in my book Exoplanet Observing for Amateurs, citing as an example the monitoring of exoplanet transits. The rule-of-thumb for when amateurs may be able to contribute something of value is based on the concept that amateur telescope time is free, and amateurs are willing to observe for long hours if they are motivated, so: a task may be suitable for amateurs when many hours of monitoring a star's brightness is required (as illustrated by the role of AAVSO). WD1145 is an example of a star whose brightness changing behavior is well-suited to amateur observing since many hours of observations are needed to determine behavior patterns. 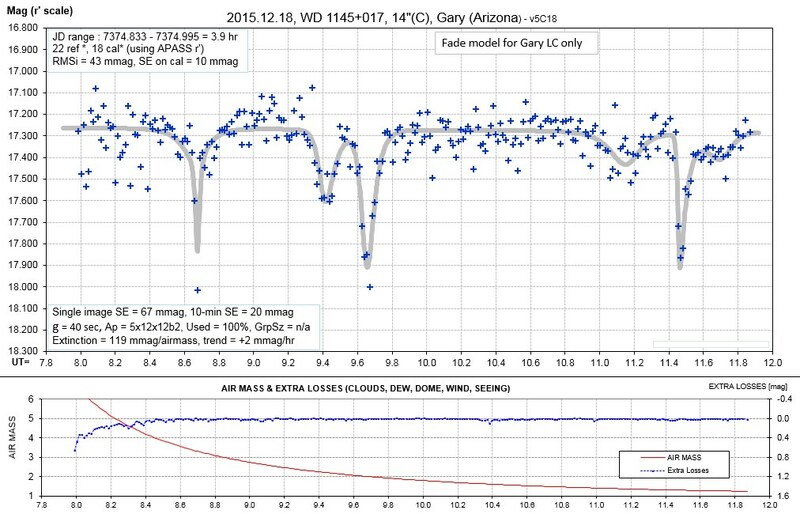 Why, I ask, didn't the professional astronomers who knew about WD1145, and the need for follow-up observations, ever consider asking for help from us amateurs? 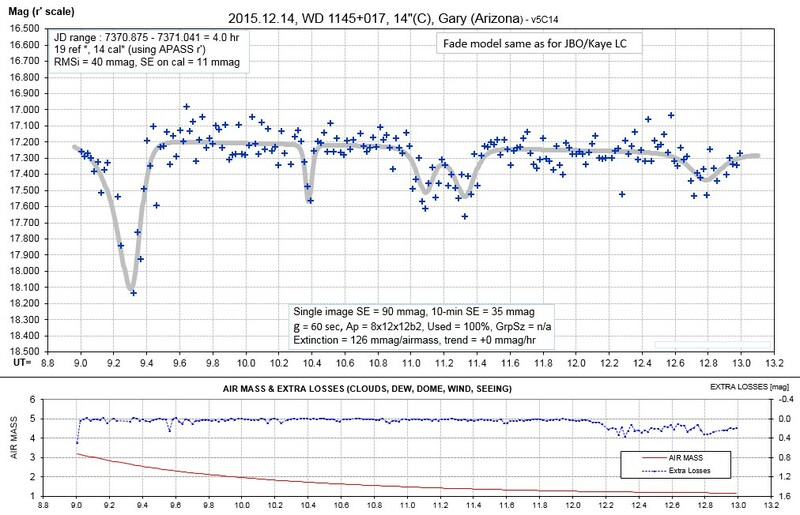 In 2015 February, when I estimate that the professionals were formulating follow-up observations, they chose to pay for expensive time on large aperture professional telescopes instead of contacting advanced amateurs to inquire about the feasibility of far more hours of (free) observations. If they had contacted me in February of March we could have observed the target when it was high in the sky and observable all night, as was done by the professional telescope observers. 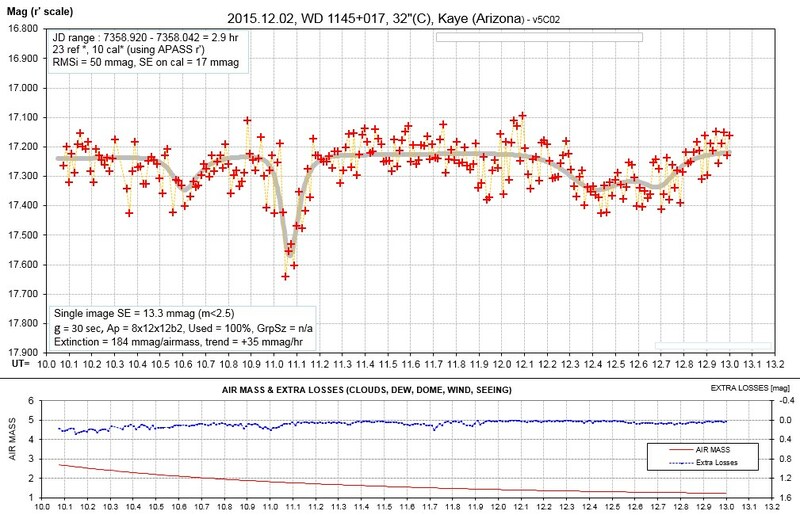 Instead, we amateurs didn't know about WD1145 until the arXiv article appeared in late October. By then the target could only be observed for ~ 1.5 hours, before sunrise, when it was low in the sky, suffering from high air mass extinction (worse for a blue star due to atmospheric Rayleigh scattering). In spite of this handicap, we amateurs achieved in 2.5 months what the professionals failed to do a half year earlier during a similar interval under far more favorable circumstances, and with larger apertures. 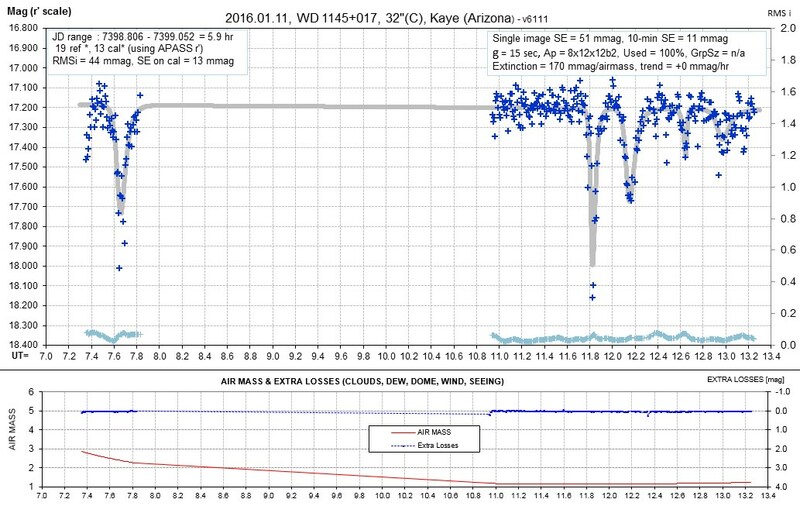 When I contacted Dr. Bryce Croll to ask if I could help support him with his planned future observing project, starting in 2016 February, he just wanted a vague assessment of activity level, and possibly an ephemeris for dips, in late January. He had no idea that I would be able to do more than that. 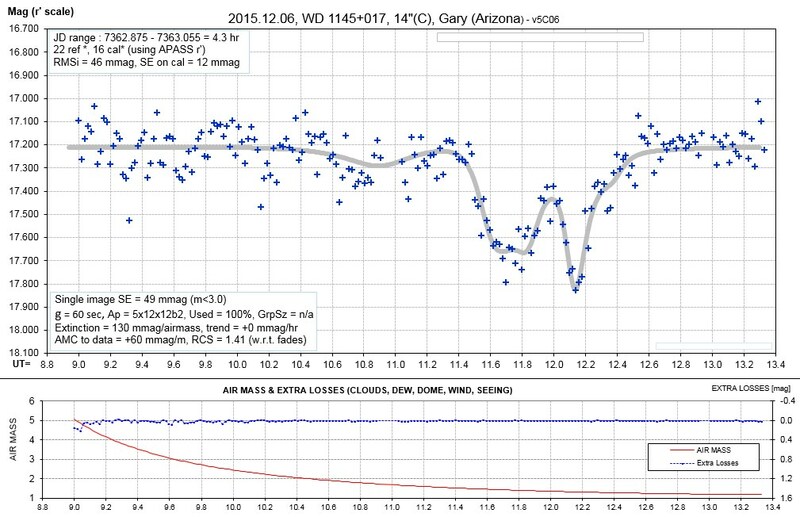 I was more optimistic, since I had recently measured the phase-folded rotation light curve of a 19.6 mag Trojan asteroid, and showed that as it rotated its brightness varied with an amplitude of 0.23 mag. My first observation of WD1145, Nov 1, established feasibility, and a week later (Nov 8) I acquired a 35% dip with a trailing tail that demonstrated a capability with far more scientific usefulness than was initially envisioned. 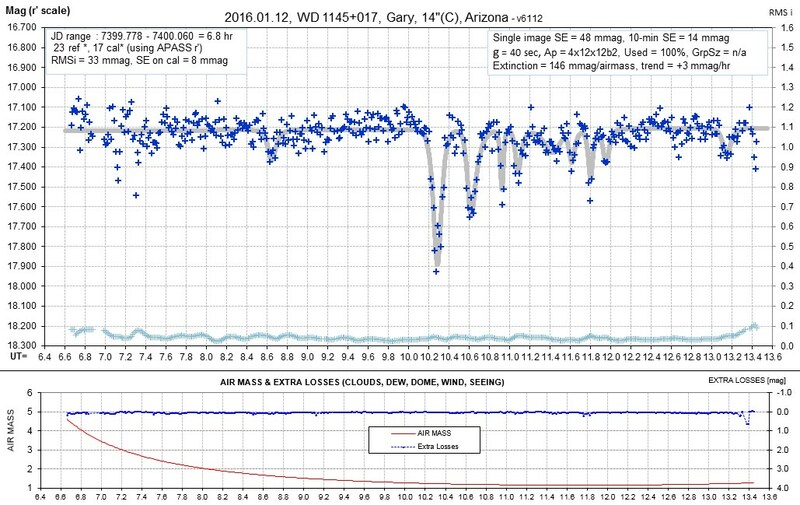 The next observations showed 3 dips, then 5 dips, and by then it was clear that a 14" aperture telescope was showing a different level of dip activity than had been seen by the professional telescopes a half year earlier. 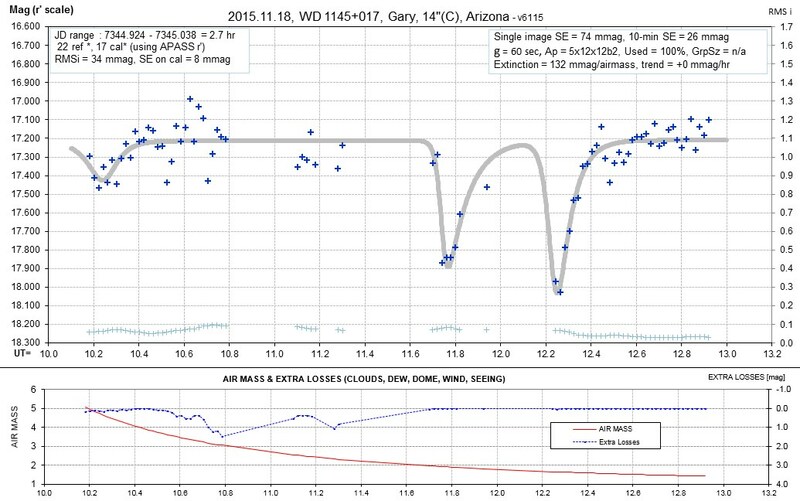 I recruited 3 more advanced amateurs to observe, and on Nov 21 two of us corroborated on the presence of 11 dips during a 3.2-hour observing interval. The only encouragement we got from a professional astronomer was Dr. Saul Rappaport, a theoretician; there was minimal e-mail acknowledgement of our work by anyone else. But I knew that our amateur team was capable of doing what the professionals were planning to do months later, under more favorable conditions and with larger telescopes, so we amateurs moved forward with observing whenever skies permitted. By mid-November we saw evidence for "drifting" of dip features to earlier times than the published principal orbit period could accommodate. At Tom Kaye's suggestion we began making "waterfall plots" to convince our lone professional collaborator, Dr. Rappaport, that drifting was occurring. After about 3 weeks we convinced him that the dips drifted, and thus began a new focus of our observational/theoretical collaboration. Dr. Rappaport came up with a novel idea that the parent asteroid was filling its Hill "sphere" (a football-shaped volume), and fragments that broke off at the L1 end would be in orbits with periods that would produce the drifting that we had found. After this, it was clear that our small team of 4 amateur observers and one theoretician may have "cracked the case" of WD1145. Returning to my original question: Why didn't the professional astronomers who knew about WD1145 a year ago invite us amateurs for help? I'm faulting observational professionals, for they should have known that large aperture telescopes weren't necessary for follow-up observations. We amateurs could have done a much better job last March, when the target was high in the sky and observable all night, compared with the handicapped conditions in November. Our telescope time is free, and we could have obtained many more hours of observations than were obtained by the few large aperture professional telescopes that had been used during last March, April and May. The article that we're submitting to ApJ (2016 Jan 26) could have been submitted last summer if we had been asked to help. Did they neglect us because they were unaware of our capabilities? Or maybe because collaborating with amateurs is a career killer? I don't know the answer, but I hope that professional astronomers will gradually learn to appreciate the potential value of pro/am collaborations because we have a lot to offer, and the price is right. And in case any amateurs are reading this, and wondering about collaborating with professionals, I have some advice: Don't! Vanderburg et al (2015) arXiv (Nature, 2015 Oct 22). Rappaport, S., B. L. Gary, T. Kaye, A. Vanderburg, B. Croll, P. Benni and J. Foote, MNRAS (final approval 2016 Feb); arXiv (1602.00740) link. This site opened: 2015.08.25 by webmaster B. L. Gary.